NOTICE: We will not be at the Bayview Bar & Grill In August as I had hoped as I made a mistake and forgot that Rick is not available on the 7th and I did not put it down on the calendar and we all know we need Rick and want him. As far as the 14th is Dan’s day to take off as it is his sons Birthday and they made plans and again I did not put it on the calendar. So thanks to Ramona at the Bay View for my totally confusing her and letting me move that date to the Sept Oct and Nov instead of Aug. Sept. Oct. Thanks Everyone every now in then I do get a BRAINFART! It is time to update the webpage and it needs to be done now as I truly have not had time until now as Alan with the band and alone has been very busy. Summer is here and just about gone. I keep asking at 10 PM where did our day go and why is it going so fast? From morning to late evening I am either on the phone or at the computer making sure the schedule is up to date and making sure the schedule on the web page is updated. If all goes well I can get it done but when the computer decides it is got its own mind then there is trouble and that says the same thing for my printer and yes I do think it is operator ERROR! as far as my printer I am sure it is possessed. Then there is Grandson’s balls games that we usually make most of them but this year the band was busy on most of those Sundays and did not get done in time to make the games. We squeezed in the All School class reunion for Alan as they are planning next years as it will be their 50th. Wow you say yes but Alan says he never feels his age and as long as he can play and Sing he will. With saying that the planning commission asked Alan and the band to play. So many of his class mates remember him from school as the Singer and guitar player and so it was just natural for him to be a part of that. It looks like summer finally made it to Minnesota. I know I was thinking it might not get here it did and I for one am very glad. It seems like I just updated the website but it has been a month. We were out to the Fish Lake Resort if you are looking for a bigger dance floor then this is the place to come. 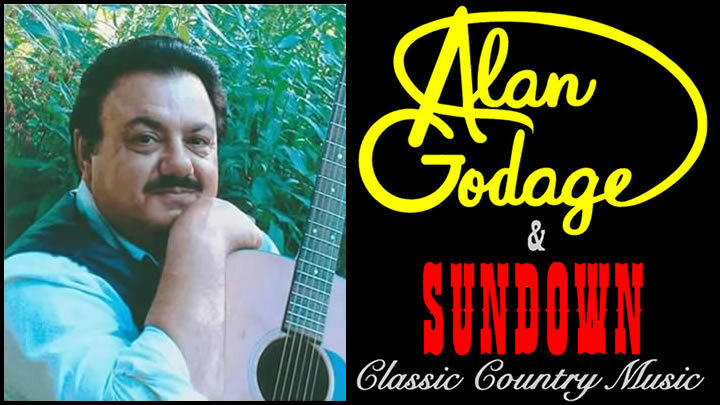 Jeff is the owner and is really giving Classic Country Music a try out there, They have food, a beautiful lake , nice dance floor and Great Classic Country Music Alan Godage & Sundown what more could you ask for on a nice summer evening. Come on out and see for yourself. Now for you that have been wanting us in the Metro area we are there. We are playing at the N.St.Paul American Legion, what a fantastic club nice dance floor, great staff. We are also at the Medina. Many of you have been bugging Bob to bring our band in there as you like the HUGE wood dance floor and great Classic Country music they go together. So I would like to see a few more of our loyal fans and friends there so we can keep coming back to the metro area. June really seemed to fly by and here we are already heading into July. I want a long warm summer as I like it hot and so far we we have only have a few warm days. Maybe we will have a long nice fall. Alan raises all his garden plants from seeds his garden is looking just great. He plants, I water and we both put up the produce. This year his garden looks exceptionally nice. If you go to the pictures you will see its progress as I will keep taking updated pictures. Every woman should be so lucky. I hit the jackpot a man who can sing and loves to garden. We put enough garden in for the whole family as they seemed to miss that gene. But they don’t mind coming home for the finished product. Everything from green beans to salsa. Alan will go into more detail on all the summer gigs in the newsletter but he does not do anything on the webiste so I try to keep you all in the loop as much as possible. We are playing at the Bridge Tavern on the 5th of July so if any of you are up north at the cabins and want a going home treat stop by this club and see us this is a REAL HONKY TONK with a real waitress to wait on you, a nice dance floor and GREAT FOOd come out and say to hi JO & RUSS you will not be sorry. Have a safe and fun 4th of July Weekend. Hope to see you soon. « Summer is on its Way!